Co-founder Caleb Eckert ' '17 explains the co-op to students in James House. 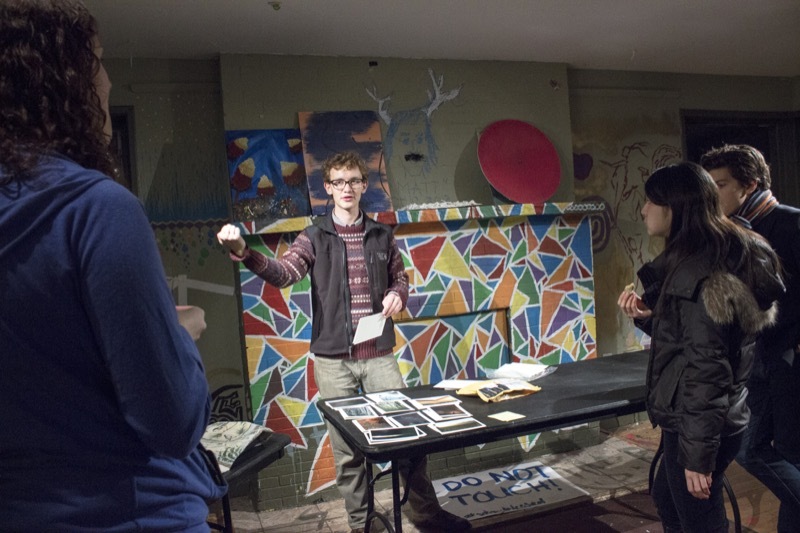 The new student-run organization, born from an anthropology course on "DIY Movements and American Environmentalism," aims to foster community through do-it-yourself projects, skills sharing, and exchanges of member-made items. Bricolage Co-op is a new student-run organization, born last spring from an anthropology course taught by Assistant Professor Joshua Moses. The group aims to foster community through D.I.Y. (do-it-yourself) projects, skills sharing, and exchanges of member-made items. To that end, one of the recurring events the group sponsors is a potluck/clothing swap/craft fair held on the last Friday of every month. In December, though, they held the event early so that Fords could shop or swap for gifts before finals started. The Bricolage Holiday Gift D.I.Y. and Exchange was held in James House, where the co-op has been renovating a room for its permanent home, and featured handmade gifts, homemade food (sweet potato-kale hash, gingerbread, cardamom sweet bread, scones, chocolate chip cookies, and chai tea), music provided by student musicians, and workshops on paper marbling and wooden top construction. Once back on campus in January, the co-op hosted a furniture-building event to create gear (a window seat, shelves) for their new space. Bricolage, the French term for DIY, means "something constructed or created from a diverse range of available things." We talked to Chloe Wang '17, a co-founder of Bricolage with Caleb Eckert '17, and Anna Saum '18, about the group's start and what they hope to create going forward. Tell us about the launch of Bricolage? The co-op was conceptualized in the course "D.I.Y. Movements and American Environmentalisms," taught by Josh Moses. I was one of eight students in the class, studying do-it-yourself movements with an environmental focus. The course was unconventional in that it was a seminar with a lab, integrating theory and practice, and one of our undertakings was a group D.I.Y. project. In our readings, we encountered themes of self-sufficiency, reclamation, and empowering production in a consumptive society. We noticed that although there is no lack of creativity on our campus, making things is often a solitary endeavor for students. This informed our decision to start a co-op as a place for makers to come together and exchange. How is the co-op structured? Right now, we have three core participants who meet biweekly to plan, organize, and build, as well as collaborators working on the Haverfarm and MakerSpace. Some of us were in the D.I.Y. class with Josh Moses and others joined later. We've been holding events that are open to all while we ready the [James House] space, and are planning to establish more formal membership in the upcoming semester. What kind of work have you done to the room in James House? We are working on the space with some vital help from Facilities—they raised the floor for us and made the path to the door accessible, and kindly provided polyurethane coating for the floor. In the fall, we sanded the floor and applied the coating, and will be continuing to build furniture and shelves that were started in the D.I.Y. class. We are looking to start with some shelves to display work, as well as tables and seating to make the room a more functional and inviting space. Those are just the bare bones and we hope it will continue to evolve through co-op projects. What do you have in the works for the spring semester? We will be officially opening the Bricolage space in conjunction with a call for new members. Membership will be flexible to various interests and commitments. It can involve producing items, working on collaborative projects, hosting workshops, monetary donations, sitting in the space as a monitor, or any combination of those things. Anyone is welcome to join, not just students. A great film screening and collaborative zine are also in the works, and activities off campus might include meeting up with Wild Foodies of Philly or visiting the FreeStore in Media, Pa. Also, Esteban Kelly of the worker cooperative AORTA, who recently visited Haverford, mentioned that he gives solidarity economy walking tours of West Philadelphia, so we would love to take him up on that later this spring. What are your hopes for the co-op in the future? My main hope is that Bricolage is helpful to people. Rather than an extra activity that students have to tack on to their busy lives, I hope the co-op can be a tool, outlet, or showcase for preexisting interests. In the cooperative spirit, it should be a way for people to come together to support each other’s projects. How do you see the co-op contributing to, relating to, or enhancing your Haverford education? The co-op ensures that I continue to engage with ideas I started to explore in class last spring. I am pursuing an environmental studies minor, and the D.I.Y. course got me thinking about approaches to environmental issues that have to do with the fundamental ways in which we live. I think it’s critical to find ways of incorporating the ideas we espouse and discuss for hours in the classroom into our everyday lives. Plus, working on Bricolage turns my attention to educational opportunities in the Philadelphia area. … Bricolage is also an important avenue for creative engagement for me personally, as a chemistry major with interests in the arts and other disciplines. As I continue to learn about the cooperative model, I am realizing that it is something I would like to be involved in beyond my undergraduate years, regardless of what I am doing career-wise.